Fisherman Bill Coppersmith plucked this very rare orange lobster yesterday from the Gulf of Maine, but amazingly, it’s not his rarest-ever catch. That honor goes to the white albino lobster he snagged in 1997. Still, the critter he dubbed “Captain Eli,” in honor of his grandson, is unique indeed. 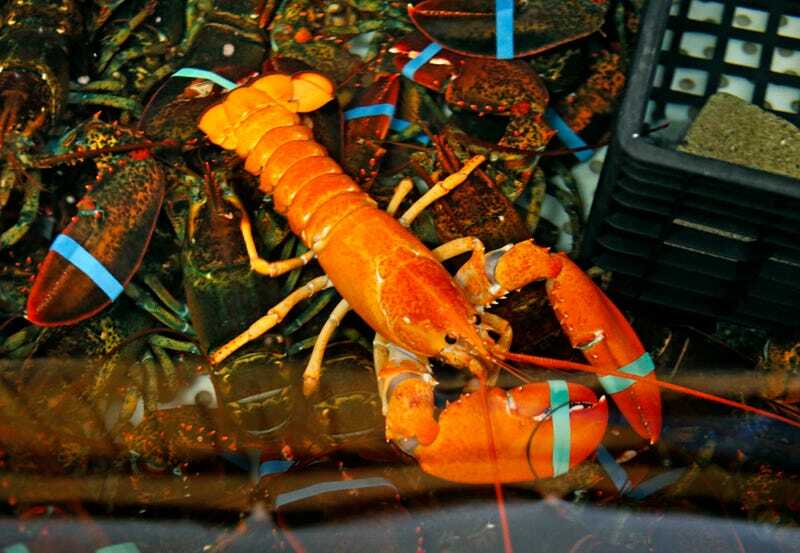 Robert Bayer, executive director of The Lobster Institute at the University of Maine, says it’s difficult to arrive at an exact number on the odds of an orange lobster. That white lobster—Coppersmith named it “Lincoln”—was estimated to be a one-in-100-million catch. For the next month or so, the Cap’n will lord over the Fisherman’s Catch restaurant in Raymond, Maine, which is owned by Coppersmith’s son. But fear not, he won’t end up on a dinner plate; when the fisherman heads back into deep waters, the celebrity crustacean will be returned to the ocean.